The November 3, 2013 Solar Eclipse @11Sco15 (in 12th house of Politics, Large Institutions, and Karma when chart is set for Washington DC) is of the 16 North Saros Series and carries a tone of Uranus-trine-Neptune, the pair of Enlightenment planets. If you've read any of my posts on Solar Eclipses you know one of my favorite resources is Bernadette Brady's book, Predictive Astrology (aka, The Eagle and the Lark). However, the date of initial eclipse in the 16N Series is apparently incorrect since I can find no Solar Eclipse--only a New Moon @6Pis02--for the date of 'February 15, 1599' though an eclipse did manifest on January 26, 1599 (NS) @6AQ19--and it has Uranus (23Ari25) trine Neptune (24Leo53 Rx), both creative Fire signs. This is important because the initial (beginning) eclipses in each Saros Series continue to flavor subsequent manifestations of that Series, and the 16N on November 3, 2013 brings forward the Uranus-Neptune tone of their trine to one another. "When I placed my head on my pillow, I did not sleep, nor could I be said to think. My imagination, unbidden, possessed and guided me, gifting the successive images that arose in my mind with a vividness far beyond the usual bounds of reverie. I saw--with shut eyes, but acute mental vision--I saw the pale student of unhallowed arts kneeling beside the thing he had put together. I saw the hideous phantasm of a man stretched out, and then, on the working of some powerful engine, show signs of life..."
As for inspirational Neptune, dreams and visions are its stock in trade, along with ruler-ship of the Collective and Personal Unconscious from whence good ideas come. Perhaps a modern-day Frankenstein/Prometheus will become unbound? For we must remember our current Uranus-Neptune constellation, their 3 conjunctions all through 1993 at '18Cap' = POLITICAL POWER, in the Sabian Symbols. Odd, isn't it, how Uranus-Neptune's Enlightenment principles and concepts so popular centuries ago have been purposefully directed into a misery-producing trudge toward a 'new world order' of totalitarianism, economic hardship, and control of populations--and de-populations. Well, these days, they like to say that Nothing Stops an Idea Whose Time Has Come, and of course, those wafting up from the Collective Unconscious are the strongest and most irresistible ideas of all. Considering the variety of fiscal and other problems our nation now faces (engineered through the centuries by politicians and their foreign backers), let's hope that American politicians will begin to behave with dignity for a change and, before the end of 2013, start implementing plans and ideas that are actually good for our nation if they can manage to override their selfish my-party-first attitude with which many of them now bedevil us. The November 3, 2013 Solar Eclipse may just inspire this possibility and my suggestion is: stop believing in the power of corrupt Global Government politicians and their control of society will evaporate like Neptunian smoke! 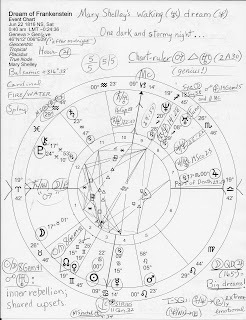 Click image to read a few basic notes penned upon the horoscope. 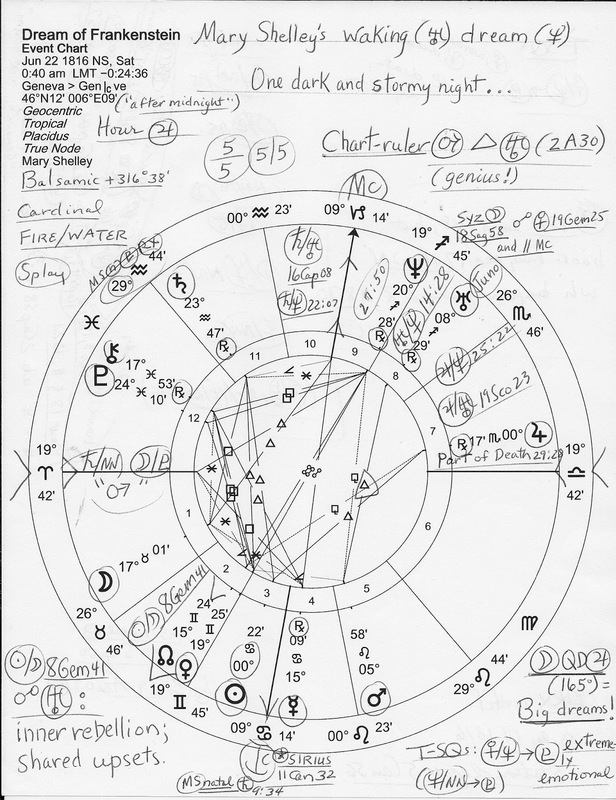 Astro-Notes: Chart-ruler Mars in creative Leo and Leo's own 5th house applies to only one Ptolemaic aspect in the chart: a trine with Uranus (2A30), said to be an indicator of genius! Jupiter @00Sco17 Rx would soon conjoin her natal Neptune (8Sco25) which enhances imagination and triggers a certain amount of psychism.